have you ever felt like you just have to have a fresh, warm slice of berry pie?? but really, who has time to bake a berry pie from scratch.. the crust alone would take forever! well, here's the next best thing. and you don't need any fancy tools or ingredients to make this, all you'll need is 5 minutes and a few pantry staples and some frozen berries. i use Trader Joe's frozen organic mixed berry blend, which is a mix of strawberries, blackberries, raspberries and blueberries. just coat the berries in some coconut flour and coconut sugar, toss the mixture into a small cast iron skillet, cover in some crumble and pop it into the oven. and voila, 15 minutes and a delicious smelling house later, you'll have your berry pie fix. 🙌 now get off your phone and go make some! 2 5 mins. 15 mins. 20 mins. in one small bowl, combine berries, 1/2 tablespoon coconut sugar, 1 tablespoon coconut flour and salt. mix until berries are coated. in a separate small bowl, combine oats, the remaining coconut sugar and flour, earth balance and cinnamon. mash together with a fork until the butter is incorporated into the dry ingredients. pour berry mixture in a small cast iron skillet sprayed with cooking oil. cover with oat mixture. 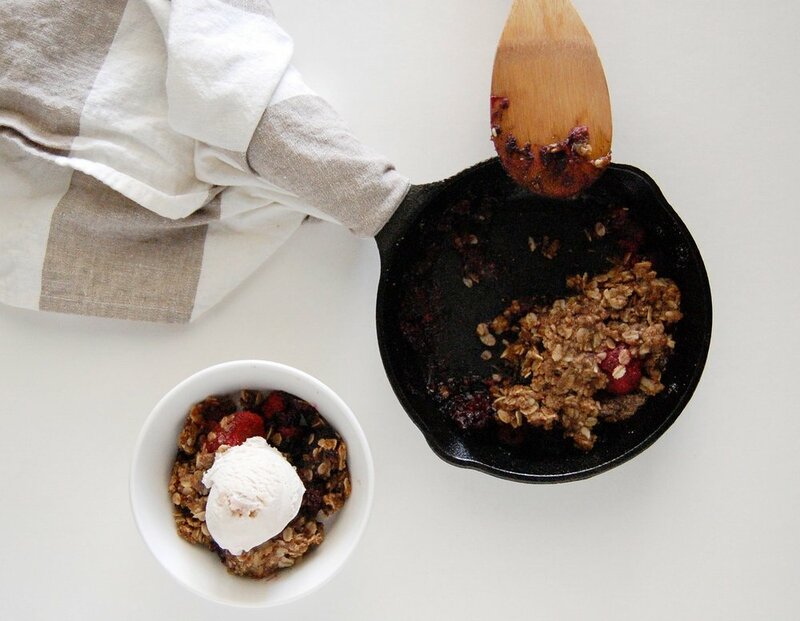 bake until oat crumble is crispy and browned and berries are bubbling, about 15 minutes. this will go great served with a scoop of your littles favorite ice cream!